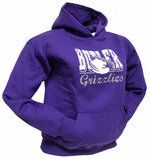 Youth purple hooded sweatshirt "Butler" and the Grizzlie Power Head imprinted in white, Grizzlies imprinted in light gray on the upper front. 50% cotton 50% polyester. Purple "Under Armour" cap with the official Butler "B" imprinted on the front and "I Will" on the back. Once size fits most. Purple and gold metallic wrist pom. 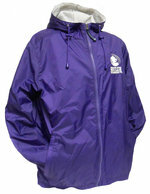 Lightweight black hooded jacket, lined 1/2 zip with front pouch pocket " Butler" and the Grizzly Powerhead embroidered in purple and "Grizzlies" embroidered in white on the upper left front. 100% polyester. Great jacket for cool days.